that you may cause to others as a result of a snowmobile accident. Liability & Comprehensive coverage policy. This program covers the liability coverage mentioned above plus comprehensive coverage, which protects your snowmobile from damages caused by fire, theft and most other causes except collision. ·This package covers everything (subject to exclusions in the policy) except damage to your snowmobile caused by a snowmobile accident. Liability, Comprehensive & Collision Coverage policy. In addition to all of the coverage’s listed above you are protected for accident damage to your snowmobile. 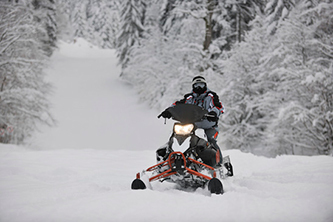 This optional protection covers co-payments, deductibles and other expenses if you need medical attention a a result of a snowmobiling incident. Tell us what accessory you specifically want to insure, and you’ll be covered up to the policy limits of the optional coverage. Whether it’s your trailer, snowmobile cover, or any piece of safety apparel.. the choice is yours. Temporary Coverage for Additional Snowmobiles. Your policy automatically adjusts to meet a state’s minimum coverage requirements, even if your policy limits are normally lower. If you’re planning to ride your snowmobile beyond our northern border—go right ahead. Your coverage extends to Canada. *Insuring two or more snowmobiles on the same policy. *Belonging to a snowmobile association. *Completing a snowmobile safety course. You can pay your policy in full with a check, money order, cash, or credit card You may also qualify to pay your premium in two or more installment payments. Fast and Reliable Claim Service. Report your claim any time, day or night.